NAD has been at the forefront of entry-level hi-fi components for decades and still produces its famous battleship grey components at a variety of price points to suit most pockets. More recently, we have seen a move towards more – dare we say it – stylish components with the Masters series at higher price points and an entry into more lifestyle components with the VISO series. Following on from the DVD-based VISO Two and Five systems, the new £750 VISO Three is the first two-channel audio member of the family. It's a stereo receiver, comprising an internal CD mechanism able to play the usual span of CD-based formats plus an FM/AM internal tuner. Additionally, a front-mounted USB socket will replay audio from correctly formatted USB sticks Supplied with the system, but separate to the casework, is an iPod dock that can be controlled from the remote (as well as curiously being supplied with a small one of its own). In markets with digital radio, the unit is available with the DB-2 DAB/DAB+ for an additional charge of £100. Backed up by a 50-watt internal amplifier it's certainly up to the task of powering the majority of speakers that the VISO Three is likely to encounter. 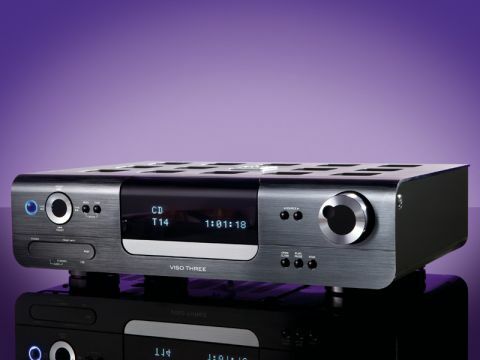 NAD has put some thought into the types of speaker systems likely to be used with the receiver and has fitted a subwoofer output to make connecting a sub, or satellite speaker systems relatively straightforward. Aesthetically, the VISO Three follows the house style of the other VISO components and this is no bad thing in our view. It's a handsome-looking piece of kit and manages to look more expensive than it actually is. The gridiron metal top-plate that curves over to form part of the front panel is a distinctive and handsome feature and helps the NAD to look smaller than it is, which is a useful attribute. The fit and finish is generally good. We like the clear and easy-to-read display and the standard of the paintwork and panel gaps is extremely high, as well. We are less sold on the volume control, which is a rotary encoder-type with no start and stop point. This is useful with very powerful pieces of equipment, but with the VISO Three, it means that it has to be rotated a fair distance to give an appreciable increase in volume. The remote handset is also somewhat fussy. We appreciate that the given the amount of functions that the unit has, the remote will be relatively complex but it is still far from intuitive, more of which later. Minor gripes aside, the VISO Three has to be considered good value for money. This is a well-specified device and being able to add DAB functionality – rather than paying for it outright – is a useful feature. The feature set, coupled with the useful power output, makes the system a strong contender in the sub-£1,000 all-in-one category. An Ethernet-enabled version would be the icing on the cake – the big display makes browsing off USB simple enough for us to believe that browsing a network would be easy to do as well. We tested the VISO Three with Mordaunt Short Mezzo 1 and Audio Note AN-K loudspeakers. Listening to CD first of all reveals many likeable traits. The overall impression is one of the classic NAD balanced sound – no one part of the frequency spectrum is accentuated or pushed forward to the detriment of other parts and it's easy to listen to for prolonged periods. This can initially lead you to feel that the NAD is a little lacking in excitement, but more accurately the unit will not inject excitement into recordings where it is not present, although choosing more upfront speakers can change this. We're particularly impressed with the soundstage the VISO Three presents; a believable three-dimensional space containing vocalists and instruments, whether that space be a tiny recording studio or open-air venue. The internal tuner and external DAB module are both straightforward enough to tune to the stations we knew to be available in the area and the same neutral, but involving sound is present and the DAB section does a fine job of keeping more compressed stations listenable. There was no DAB+ material to try the DAB module with, but the degree of future-proofing it offers is appreciated. The DAB module itself is not the smallest going, but seemed unaffected by being hidden at the back of a rack out of sight. Reading tracks over USB is simple enough and the NAD is a flattering source for compressed material. Our test range of MP3s (that vary from 320kbps/bit affairs to samples that would embarrass a ringtone) were largely left listenable by the VISO Three and it treads a fine line between revealing the detail in better recordings without mercilessly destroying poorer ones. The iPod dock is less successful, however. Sonically, the dock is similar to most other analogue output-style docks we have seen, but it is hindered by fussy connections and a truly frustrating control interface. The dock needs power and a separate data connection to function and while all the cabling is supplied, the result is far from elegant. The VISO Three impressed us generally, however, with an involving and detailed sound that is likeable and easy to listen to for long periods without ever becoming fatiguing or dull. The qualities of an engaging and unflappable sound are present and correct, and the fresh styling is a welcome departure from convention. Where we are less convinced that the system is an unqualified success, is in the control and user interface. There are enough quirks, from the insensitive volume control to the truly clunky iPod interface for the NAD to never feel as integrated as the name might suggest. Certainly, with the multiple connections for the iPod dock in place and the DAB module attached, the unit feels rather less like a cohesive all-in-one system and slightly more like an affiliation of the NAD parts bin in one (ish) box. How much this will matter to you will largely come down to whether you intend to use the CD drive for the bulk of your listening or whether the iPod dock is going to be your primary source. If it is the former, the VISO Three is too strong a sonic performer to ignore.